And for the record, the best oysters aren’t in Apalachicola. They’re in Port St. Joe! The Forgotten Coast, located along the Florida panhandle, spans an area that begins about 45 minutes east of Panama City Beach at Mexico Beach, and stretches to Eastpoint. It includes Port St. Joe, Apalachicola, St. George Island, and Cape San Blas. Henri and I were lucky enough to get to spend a week with my cousin, Charmaine, on Simmons Bayou. Not only did I get the family history and local scoop, Henri and I got to do a lot of exploring. 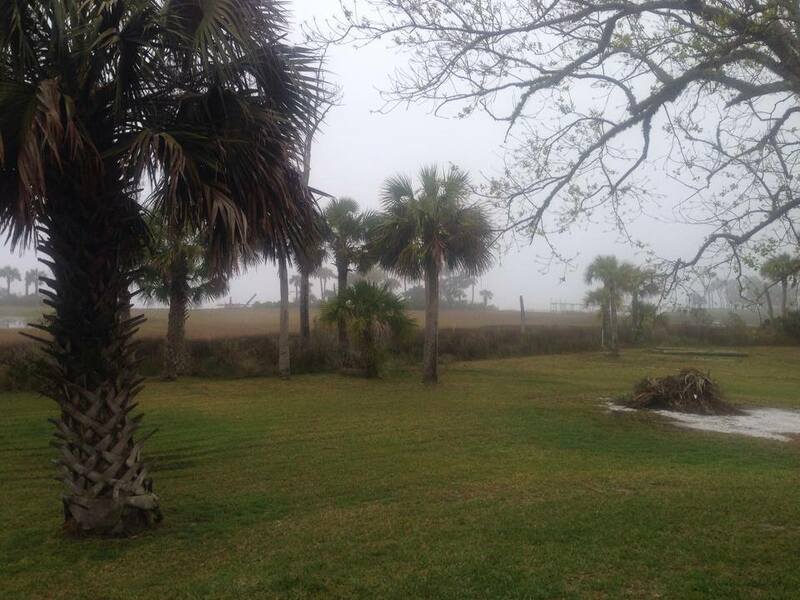 Waking up to a foggy morning over-looking St. Joseph Bay was the perfect introduction to this diverse landscape. While I enjoyed my morning coffee and waited for the fog to lift, both literally and figuratively, Henri ran through the swamp (he was NOT allowed to do this at night). We spent some time walking the edge of the bay and with a variety of animal songs to greet us, and lots of new sniffs for Henri, it was an enjoyable, albeit muddy, morning. Thank goodness for outdoor showers and Dawn! Simmons Bayou is in Port St. Joe and located on St. Joseph Bay. If you’d like to stay in Port St. Joe, I’d suggest contacting a local realtor to find a dog-friendly rental. You can find a place on the bay, but if you want beach, Indian Pass is your best bet. Salinas Park, located at the entrance of Cape San Blas, runs the length of Indian Pass and offers an almost everything friendly beach. You can walk your dog, ride horses, or drive your car. Please note: Your car may not be designed for sand and you’re gonna need some ground clearance. We got stuck. That same turn-off to ‘The Cape’ is also where you’ll find the famous Indian Pass Raw Bar. They are dog-friendly on the front porch (it’s a porch, not a patio), and you’ll have to go inside to order. Beer service is on the honor system, just grab it from the cooler on the back wall and keep track of what you had. If you have trouble with this, I suggest saving your bottle caps to count later. During the warmer months, there is live music every Friday night and often they’ll have something on the outdoor grill. This really might be the best place in the world for raw oysters, and I’m guessing the reason is that Mr. Jim, the owner (and his grandfather before him), also owns a 53-acre oyster bed where these babies are freshly harvested. The oysters are smaller, sweeter, and a little saltier than others I’ve had, and they are worth making your way off the beaten path to have a dozen or two. Be sure to take a tailgate/camp chair with you in case there’s music outside or you meet some nice folks to drink and chat with after dinner. Along the same stretch of highway, you’ll find Triple Tails. It’s only three doors down from my cousin’s house (convenient), and we’re guessing the owner might get her oysters from Mr. Jim; they were the same sweet quality. 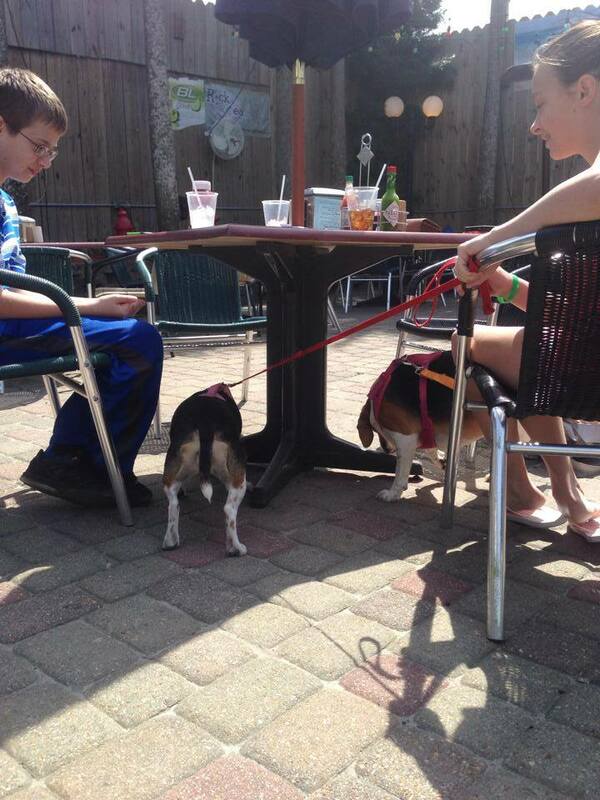 The outdoor Tiki Bar is dog-friendly and leashes are kinda optional if you don’t make a nuisance of yourself. There were several dogs there, including the owner’s Yorkie, and Duke, who’s lucky enough to live on the Cape and be a regular about town. Downtown Port St. Joe has a small shopping area and one more place you’ll want to visit. The Thirsty Goat is another locally owned restaurant with live music and a dog-friendly patio. They are adjacent to the Port Inn, which allows dogs for a $25 a day, maximum $100, non-refundable deposit. The Inn itself doesn’t allow dogs, but the Port Cottages do. Even if you don’t plan to stay there, it’s a good place to listen to some music and grab a bite to eat. Next up on our forgotten adventures was Apalachicola. This old fishing town is rich with maritime history and southern charm. For me, it’s also filled with stories of family. My great grandparents were married in the pre-civil war constructed St. Patrick’s Catholic Church and my Mema, as well as countless cousins, were baptized there. 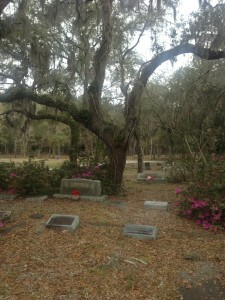 My ‘greats’, Henry and Marie, lived their entire lives in town and are buried side-by-side beneath a large moss-draped Oak in Magnolia Cemetary. We stopped for a visit. 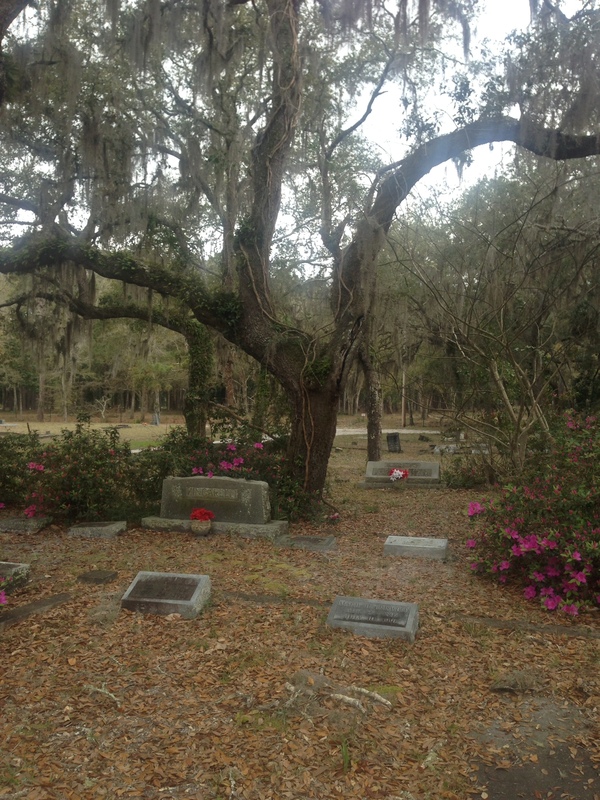 With the azaleas just starting to bloom, like most old southern cemeteries, the place had a beautiful serenity and a quiet life all it’s own. After the ‘we grew up here, and played there’ tour, we headed to downtown. 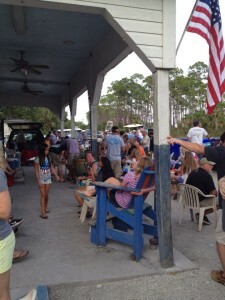 It’s an easy 20-minute drive from Port St. Joe, and boasts a great little district filled with an eclectic combination of shops, restaurants, and bars. The one shop you simply must check out is The Tin Shed Nautical Antiques and Decor. A nautical-themed flea market, they have an entire wall of old buoys, bins full of gathered shells and collected sea glass, washed-up casting nets, and old metal signs on the walls. I even found some sections of old iron fencing with mermaids perched atop each spike. 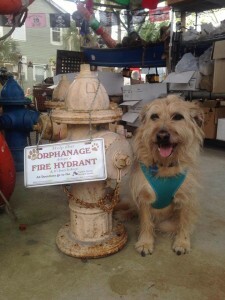 The Tin Shed also sells old fire hydrants reclaimed from surrounding areas. They are sold for $200 each, with the proceeds benefiting the local animal shelter. For pet-centirc shopping (and in support of local theater) visit OysterBones, formerly Petunia’s. ‘OysterBones’ are homemade dog treats containing ground oyster shells. I was told that many local dogs enjoy chewing on oyster shells, so the creator of OysterBones started adding ground-to-a-powder shells to her homemade dog treats. Henri really likes Oyster Bones, but he had zero interest in chewing on the empty oyster shells I saved from the many dozens of oysters of I managed to consume while in town. Did I say many? Yes. I ate oysters every day for a week. Dogs this way. People this way. In Apalach, we went to Up The Creek Raw Bar on Water Street. It has a back patio that faces the Apalachicola River. A big sign with the head of a dog and an arrow points the direction. When you go up the stairs to the restaurant look where you’re walking. 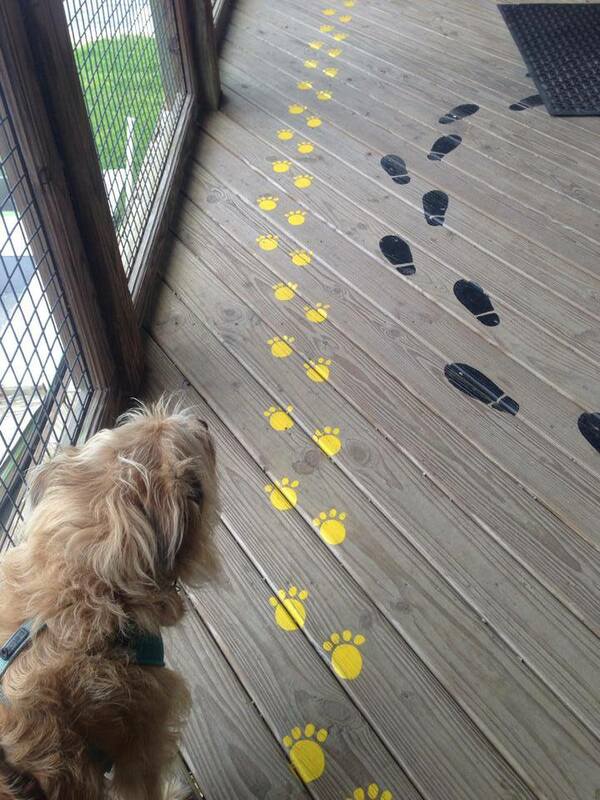 You’ll notice two sets of prints painted on the deck to indicate who goes where. The only real problem is that you’re supposed to order inside but dogs can’t go inside. The waitress immediately noticed our dilemma and happily took my order for me. Then she brought me a glass of sauv blanc and Henri a bowl of water. We call that Four Paw Service! If you’re interested in staying in Apalachicola, check out the all-suite Water Street Hotel and Marina, where you can park your boat at the dock or car in the parking lot. It’s an extra $30 a night for your pet, but there are no restrictions on size or breed. I’m not sure if they’d let you bring your pet llama, but they’ve had hamsters, guinea pigs, and birds. The front of the hotel faces the historic Orman House (I know a good, inappropriate Southern rumor about the original owner), and your balcony, a perfect place for morning coffee, will face the muddy Apalach. Water Street is right downtown, so you can walk to where ever you want to go in the historic shopping area and there’s no worries about driving if you have one to many at The Owl Cafe and Tap Room. Like beer? Check them out. There are a few tables on the sidewalk and your dog is welcome. We knocked out Cape San Blas and St. George Island in one day. Both places have wonderful beaches, great shelling, and beautiful gulf water, but aside from the Trading Post, where you can get just about anything you need for the weekend, and Weber’s, home of some really good donuts, The Cape doesn’t have much else. 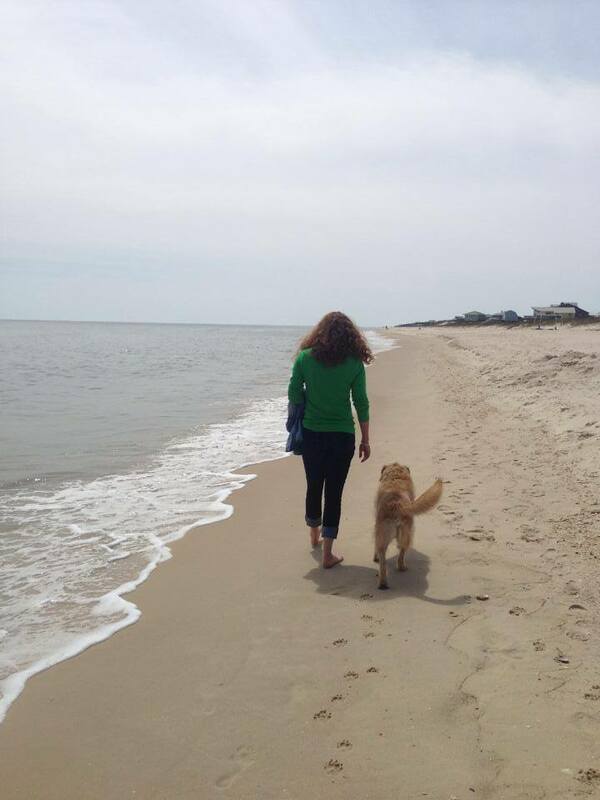 Consistently ranked one of the best beaches in the United States and very dog-friendly, it is strictly for unplugging. My cousins rent a house there every year. It’s where they build bonfires on the beach, play board games on the porch, take turns cooking dinner, and catch up on reading. If peace and quiet is what you want, The Cape is the place. We aren’t really peace and quiet types. We need restaurants, bars, and live music if we can get it. On St. George Island, you can. So after an off-leash* beach romp and some shelling, we stopped at Harry A’s for lunch. *The signs say dogs must be on-leash, but it’s worth noting that we met several dogs who were not leashed. One was an actual resident of the island and it seems that if your dog is well-behaved and under control, no one is going to call the beach dog police. At Harry A’s not only is their patio dog-friendly, so is the restaurant. Our waitress told us that sometimes the weather just isn’t nice enough to sit outside. Since they try to accommodate all of their guests, well-behaved pooches are allowed to sit quietly beneath their owners at the indoor tables. If it’s raining on the island at 4 p.m., Harry A’s has happy hour all night! Our next island stop was purely an accident. My cousin was trying to make me leave, but I heard music. And they had a patio. And it was oyster happy hour. So, we had to check out Eddy Teach’s. Eddy’s is an open-air restaurant with picnic tables set up around it. The music stage is in the parking lot. There were several dogs there and the place was packed full of people taking advantage of the gorgeous afternoon. My great grandmother’s sister’s great grandson, Travis, was also there. My cousin introduced us and we talked about dogs. He has a black lab. The thing I love most about St. George Island is that it’s anything you want it to be. You can chill on the beach with a good book or dance at a bar and make new friends. There is a well-stocked grocery store with fresh fish, beer/wine, gourmet cheeses and deli meats, and at least one decent brand of dog food. There are lots of cottage rentals available, or you can stay at the St. George Inn. They charge a one-time $50 pet fee for your stay, but there are no size or breed restrictions. The innkeepers, Carli and Jayme, assured me the staff love their animal guests as much as their humans ones. As pet-friendly as the Forgotten Coast is, the other two things I keep mentioning are oysters and music. Most people know about the oysters in this region, but the music can sometimes offer you a surprise. It’s mostly local, but there is a bit of a Nashville here and you never know who might be playing. If you’re looking for a big name performance, you’ll likely be disappointed; these are small towns. However, if you like the Nashville singer-songwriter thing, then you might score an unplanned drop-in of some up-and-comer whose name sounds vaguely familiar. I’m guessing it could have something to do with the presence of Charlie and Dana Hunt Black, who call Port St. Joe home. To make the most of your Forgotten Coast adventure, I suggest you plan your visit around a weekend, including Thursday. 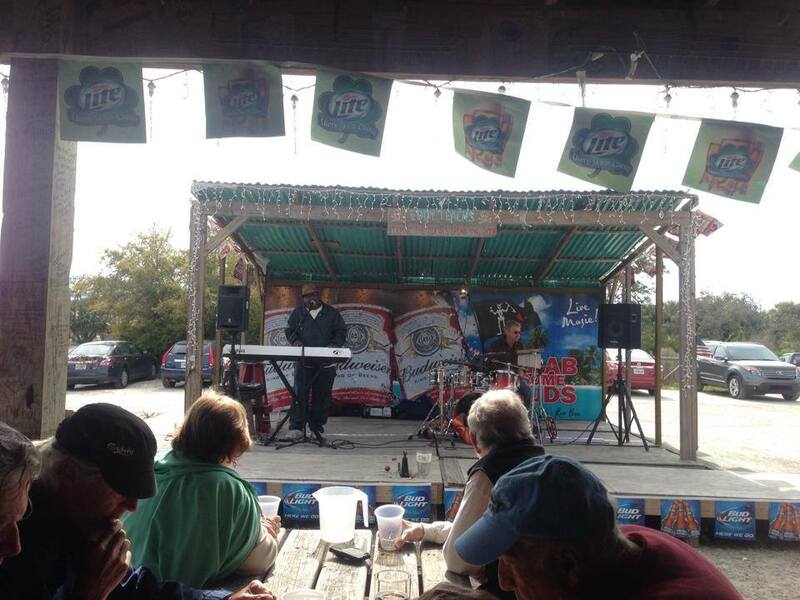 Then find yourself a place with some live music and oysters. You could luck into more than one pearl. For more photos from the Forgotten Coast, visit our Facebook album. To keep up with our adventures FOLLOW US on Facebook, Twitter, and/or Instagram. Love your blog. Great information. Us Dog Lovers need dog friendly travel tips. Thanks for the research you do. Research is hard 😉 Please let us know if there are places you’d like us to explore, and thank YOU for following. HI Christy! I’m glad you enjoy the blog. Franklin/Gulf County area is absolutely one of my favorite places. I just know you’ll love it. I hope you’ll share some photos of Gracie with us and let us know what you enjoyed most about your trip. Henri said to tell Gracie he thinks she’ll love the beach. Thanks for reading! Thank you for the comment and clarification. My grandmother was born and raised in Apalach and I still have family there. I don’t know where Mr. Jimmy’s oyster beds are located, I just know his bar (and the best oysters) are in PSJ.